Kids' ocean based birthday parties in Cornwall they’ll love! Join ur expert instructors for a Beach Party! For unforgettable beach parties packed with fun, wonder and active entertainment, book your kids birthday party with Newquay Activity Centre. Down on Newquay’s infamous Fistral or Towan Beach, your child can treat their friends to a hands-on ocean bound adventure! Choose between coasteering, bodyboarding, surfing or our fun-packed Fistral Rangers birthday party package, or create your own bespoke party combining these experiences. Providing all party goers can swim to a basic level they’ll be set to see the coast like never before. Our fully qualified, Surfing England Instructor and Beach Lifeguard qualified staff are CRB checked so they can safely work with kids at children’s birthday parties. Each child needs to bring a completed medical declaration and consent form, please note those without will be unable to attend. All adult party guests may use the activity centre for the duration of the party and a parent or guardian must stay with the party during any surf session. Coasteering: Introduce your birthday party group to an up-close and personal view of our glorious coastline with a coasteering session. They’ll clamber through caves, jump into water, go wild sea swimming and discover nature in undisturbed habitats. Surfing: Add a touch of adrenaline to your child’s next birthday party as they catch their very first waves. Our professional surf coaching will offer your party an unforgettable experience that includes valuable in-water skills. Bodyboarding: Get your tribe of enthusiastic birthday partygoers riding their first tube with our bodyboard coaching for children. They’ll learn to ride waves in a safe, fun environment where they’ll be shredding waves in no time on pro-standard bodyboards. 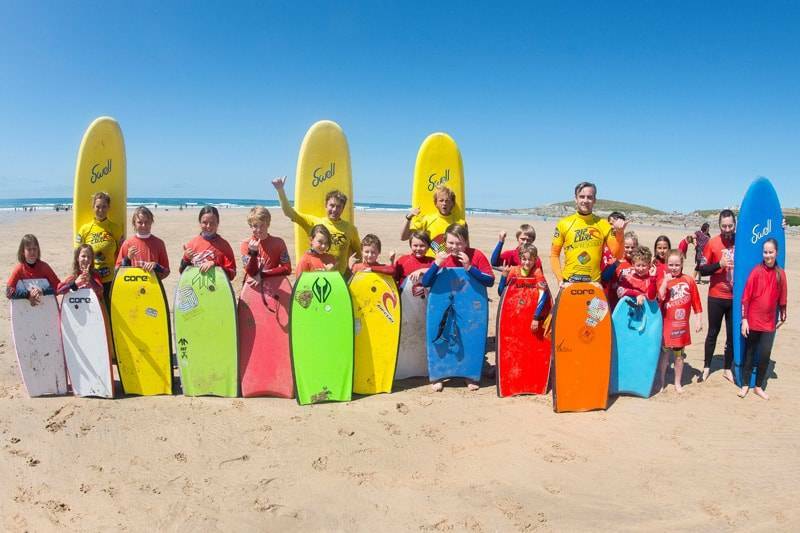 Fistral Rangers: Give your kids and their friends the birthday party of a lifetime with Newquay Activity Centre’s incredible Fistral Rangers Crew! They’ll show them how to fish, explore rock pools for crabs and anemones and how to forage, sampling some of nature’s finest marine delicacies!